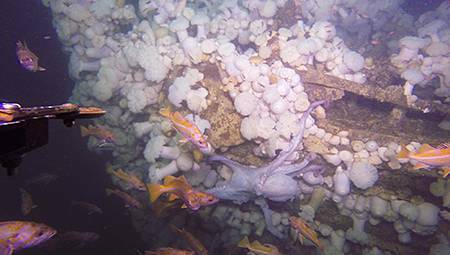 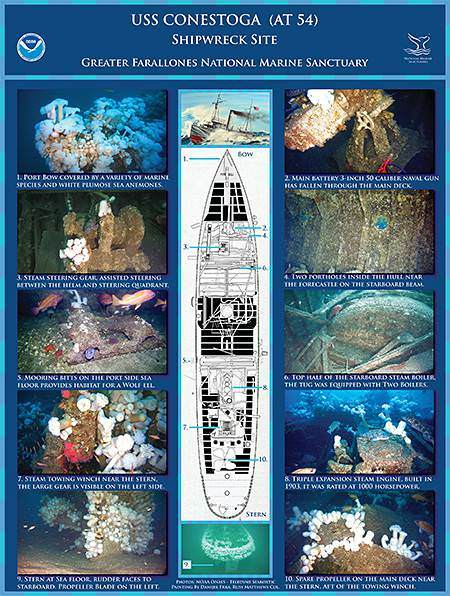 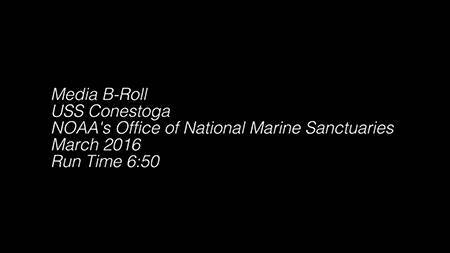 On March 23, 2016, NOAA's Office of National Marine Sanctuaries (ONMS) and the U.S. Navy announced the discovery of the wreck of USS Conestoga within the waters of Greater Farallones National Marine Sanctuary in California. 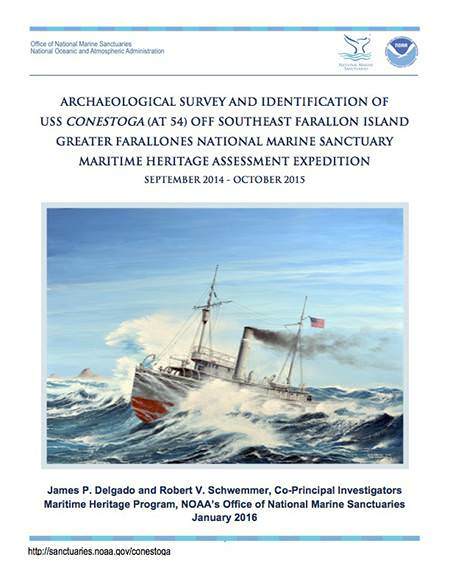 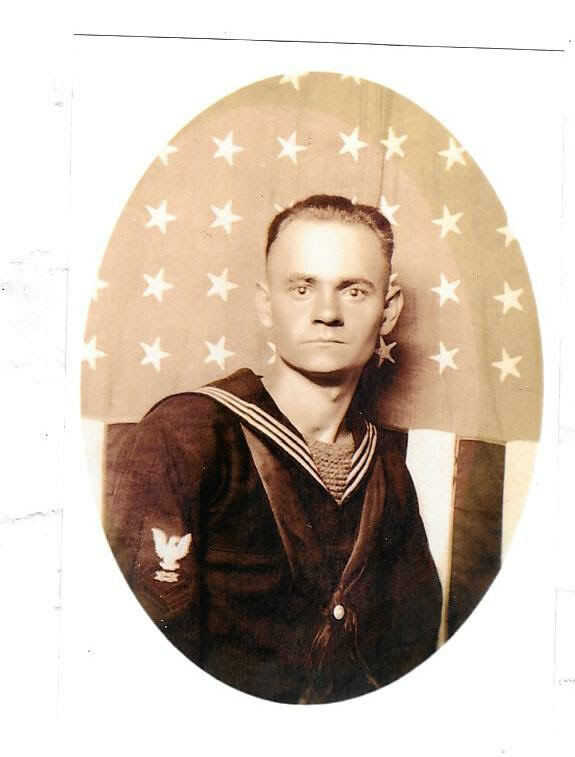 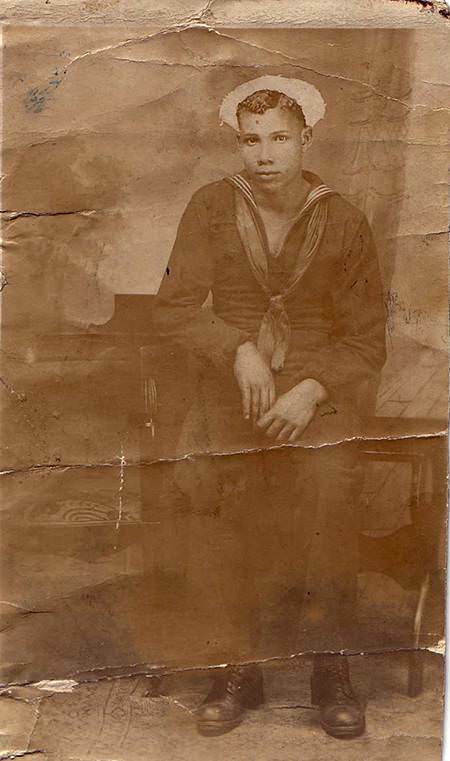 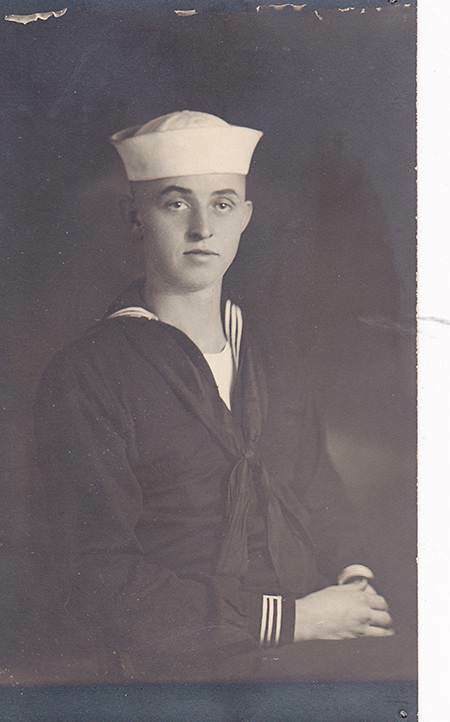 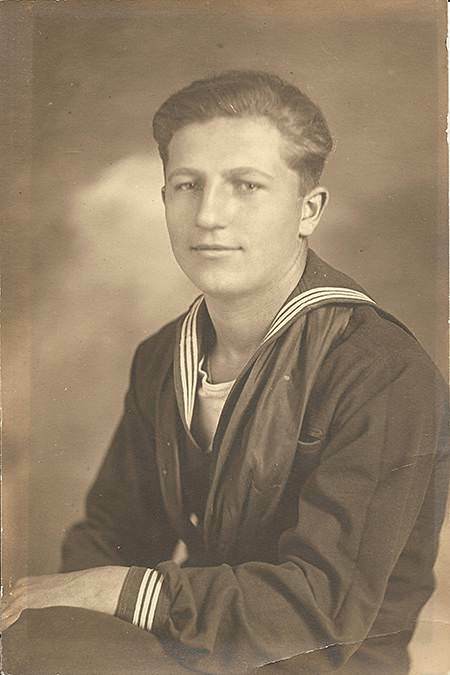 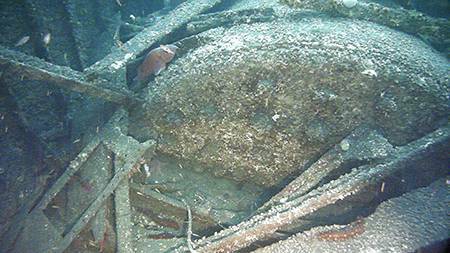 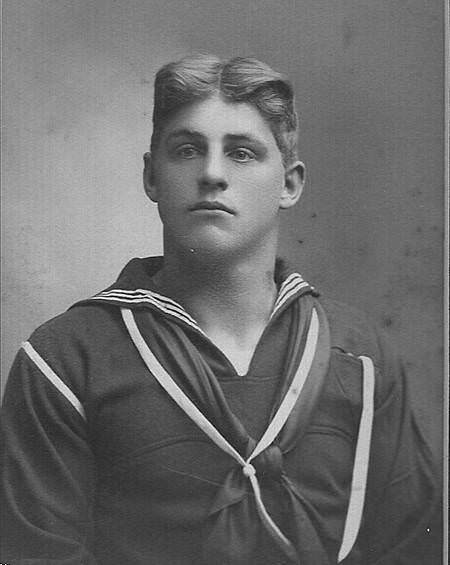 The discovery by the ONMS Maritime Heritage Program solves a 95 year-old mystery. 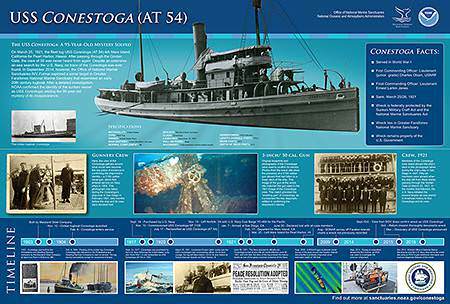 Conestoga sailed from San Francisco Bay on March 25, 1921 and vanished with 56 men. 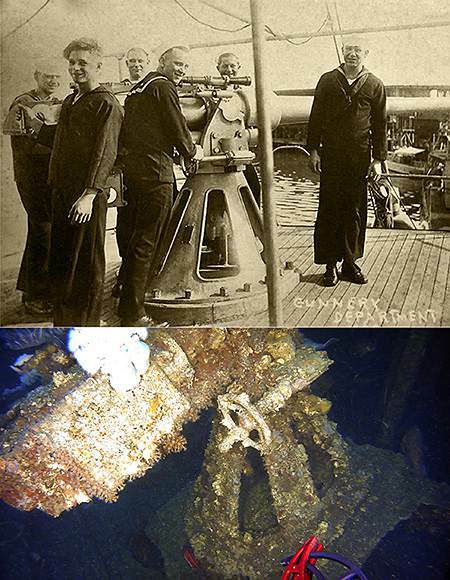 Until now, what happened, and where the wreck and its crew lay, has been described as one of the top maritime mysteries in U.S Navy history. 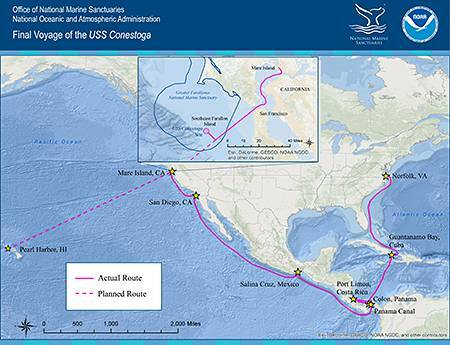 Conestoga's final resting place in Greater Farallones sanctuary is federally protected under the National Marine Sanctuaries Act and the Sunken Military Craft Act. In September 2009, a NOAA/Fugro multibeam sonar survey of the area around Farallon Islands documented a probable shipwreck with an estimated length of 52m (170ft) at a depth of 56.5m (185ft). 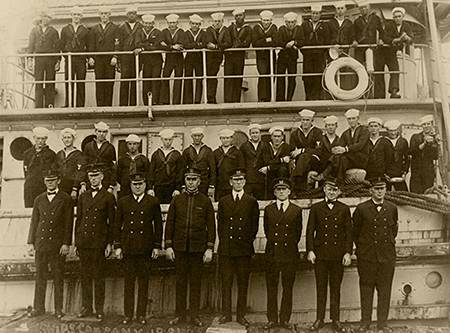 USS Conestoga gunnery department posing with the tugboat's main battery, a 3-inch 50 caliber naval gun, photograph taken at San Diego, California 1921. 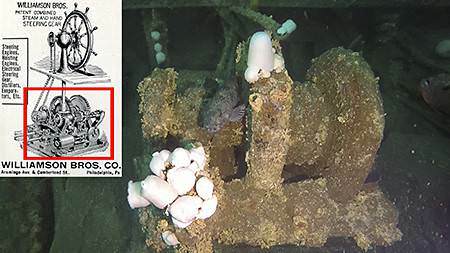 Lower photograph is the current position of the gun inside the shipwreck near the forecastle after the gun's support platform had fallen from its original position in front of the pilot house through the main deck. The gun was a key diagnostic artifact or "smoking gun" that served to identify the wreck as the USS Conestoga. The current position of the gun inside the shipwreck near the forecastle after the gun's support platform had fallen from its original position in from the of the position in front of the pilot house through the main deck. The gun was a key diagnostic artifact or "smoking gun" that the served to identify the wreck as the Conestoga. 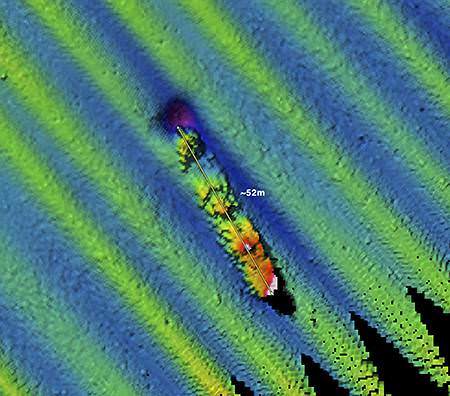 Probable letters on fantail from the vessel's name. The steam steering gear lies inside the shipwreck USS Conestoga, having fallen through the main deck from its original position located below the pilot house. 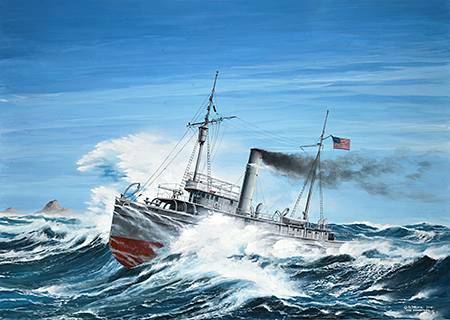 According the Marine Engineering publication dated August 1904, the civilian tugboat was equipped with a "Williamson steam-steering engine 4 1⁄2 by 4 1⁄2-inch double cylinders." 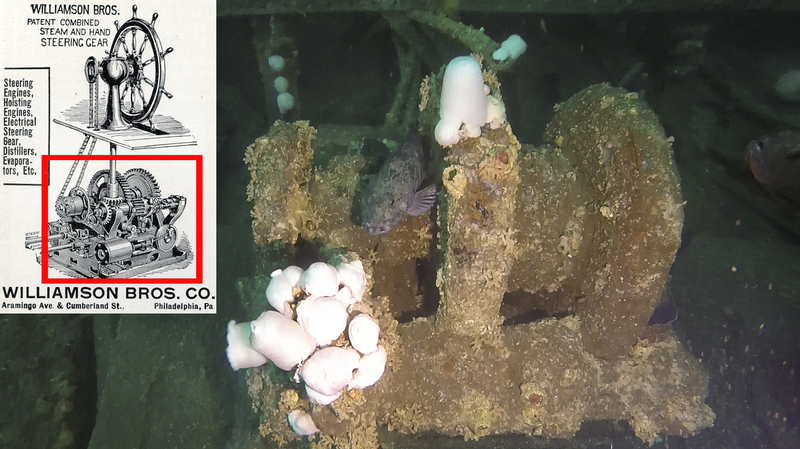 The steering gearing served as "power steering" to assist the rotation of the large steering quadrant and rudder in the stern of the tugboat. 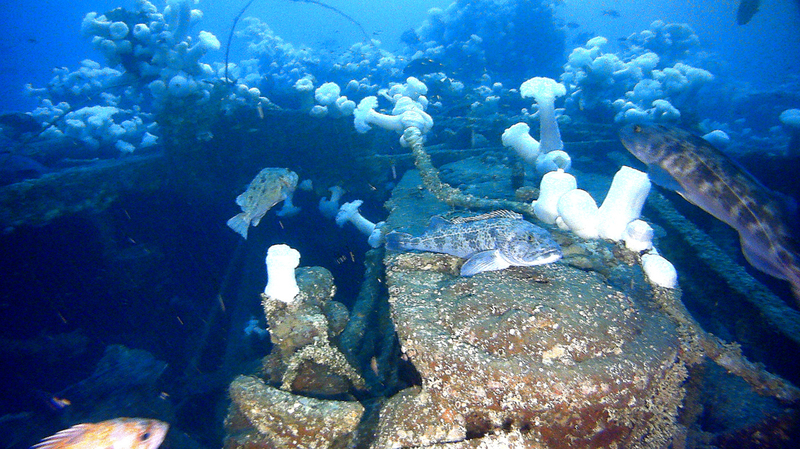 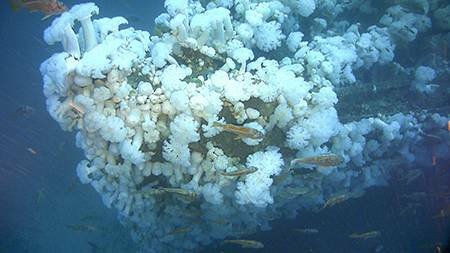 Stern view of the shipwreck USS Conestoga colonized with white plumose sea anemones contrasting the water column. Inside the boiler compartment, showing part of one boiler and collapsed debris from the upper works of the tug. 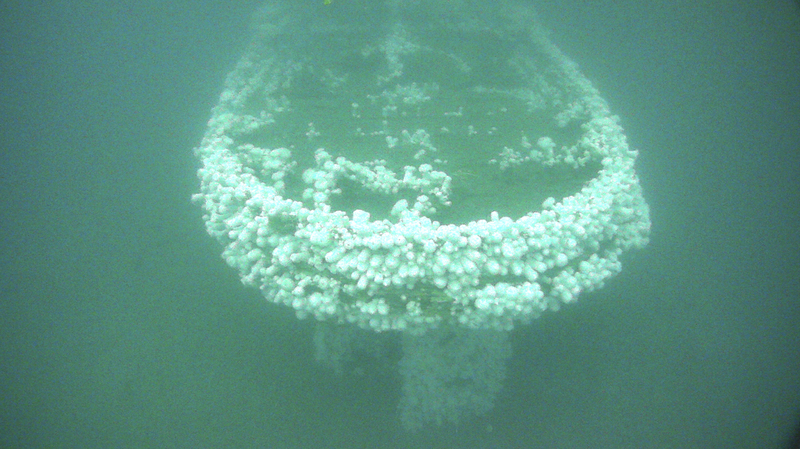 Starboard bow view of the shipwreck USS Conestoga with the top of the stem visible. Port bow of the wreck, showing the rub rail mounts, a hawse hole, marine growth, and a giant Pacific octopus. 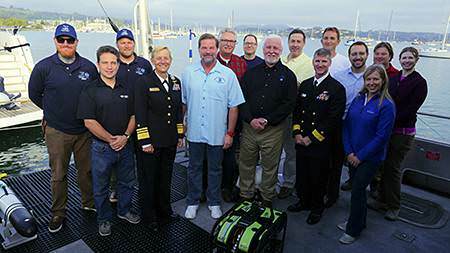 2015 Expedition team on board the NOAA research vessel Fulmar during a visit by U.S. Navy leadership, Vice Admiral Nora Tyson, Third Fleet, and Rear Admiral Markham Rich, Southwest Region. USS Conestoga (AT 54), the last known broadside photograph taken likely during WWI when the tugboat was equipped with a 3-inch 50 caliber naval gun and two machine guns. The tugboat was later equipped with only a single 3-inch 50 caliber gun when it disappeared while en route from Mare Island to America Samoa, by way of Pearl Harbor in 1921. 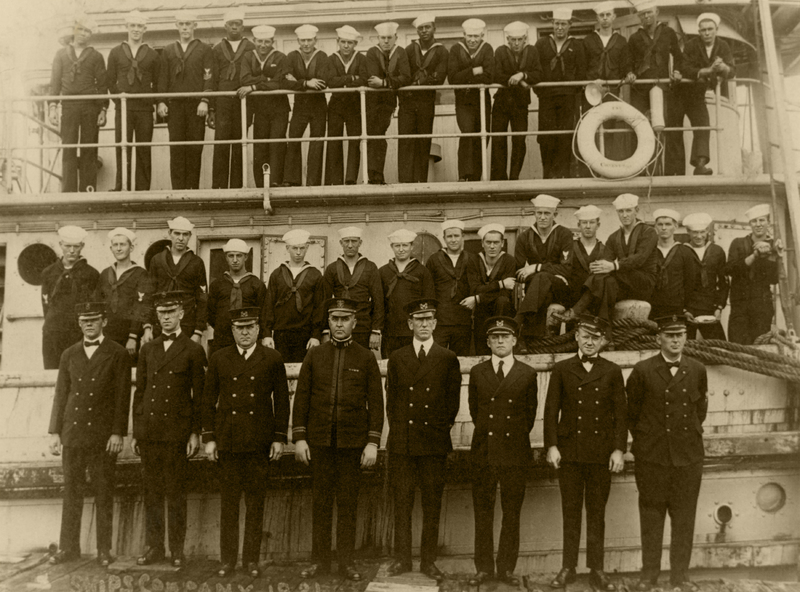 Ship's Company beside and on USS Conestoga, at San Diego, California, circa early 1921. USS R-14 (SS 91) under full sail in May 1921. 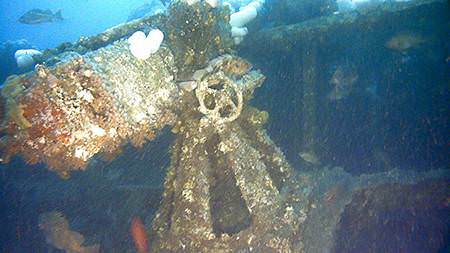 While searching for the missing USS Conestoga (AT 54) southeast of Hawaii, the R-14 lost her powerplant. 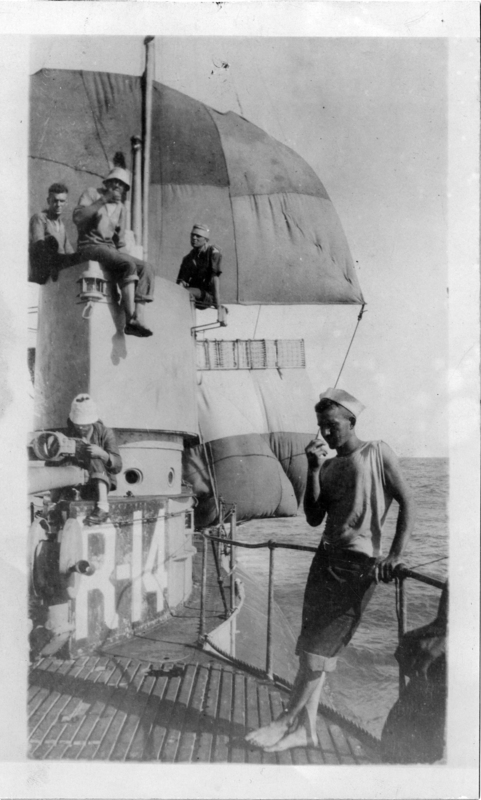 As repairs were unsuccessful, her crew rigged a jury sail, made of canvas battery deck covers, to the periscope and sailed her to Hilo. 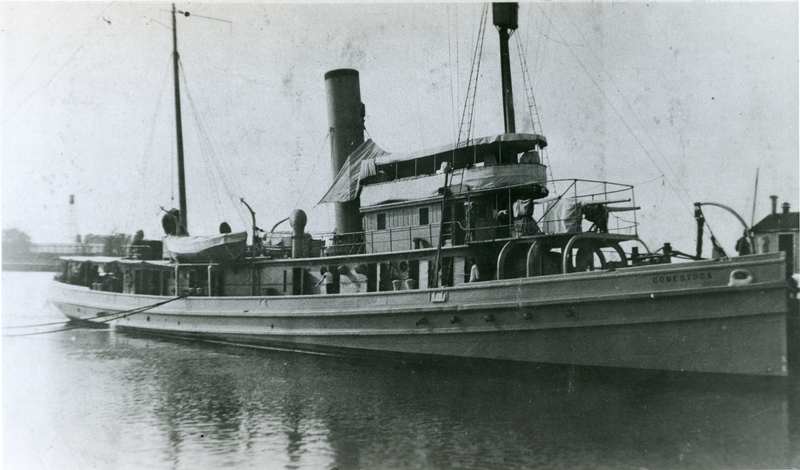 She arrived there on 15 May 1921, after five days under sail. 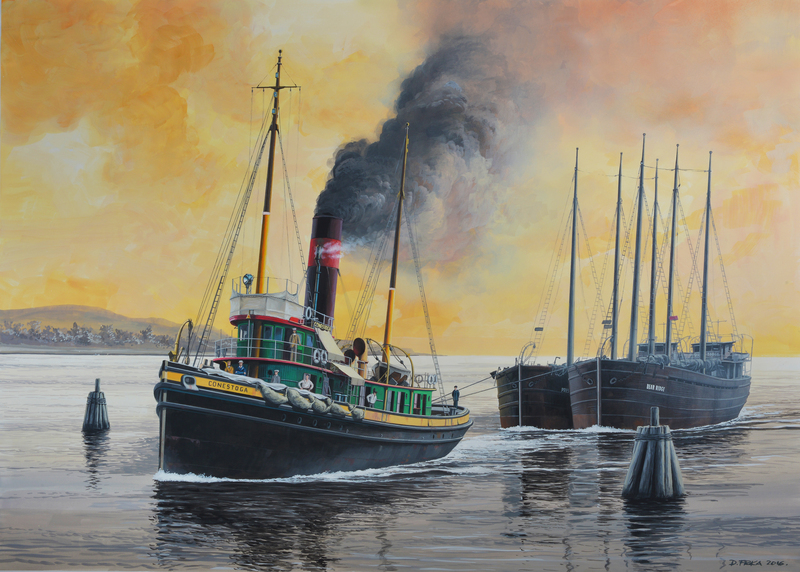 Modern painting of Conestoga as a civilian tugboat towing schooner barges of coal for the Philadelphia and Reading Railroad Company. 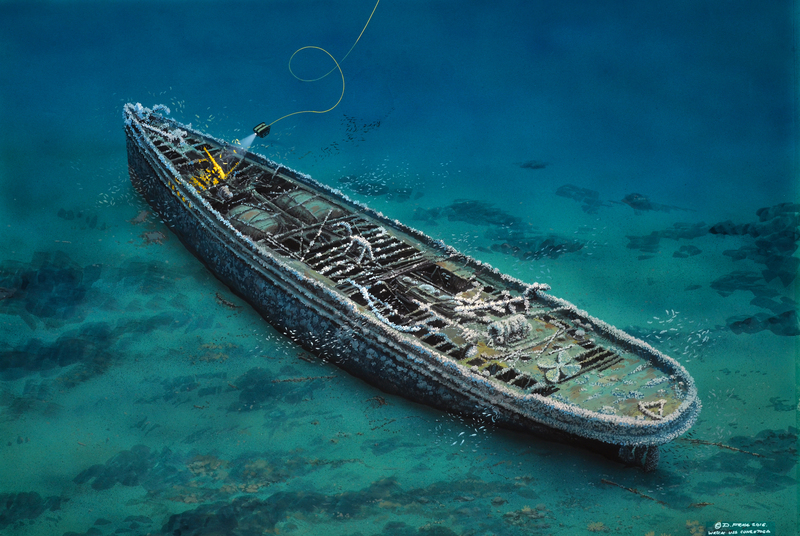 Modern painting of the shipwreck site of the USS Conestoga (AT 54) based on the site interpretation by NOAA ONMS maritime archaeologist. The shipwreck is located off Southeast Farallon Island and lies in the federally protected waters of Greater Farallones National Marine Sanctuary. 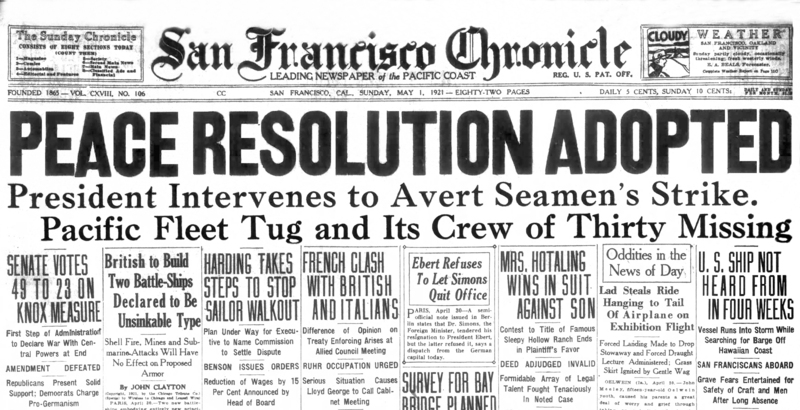 San Francisco Chronicle front page newspaper dated May 1, 1921, "Pacific Fleet Tug and Its Crew of Thirty Missing." 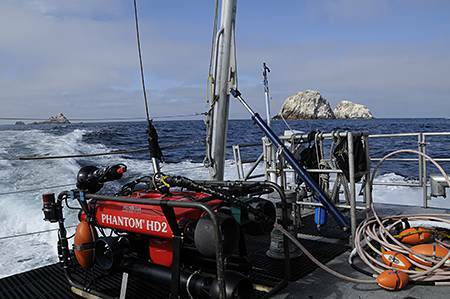 During the September 2014 maritime heritage expedition aboard the NOAA research vessel Fulmar, a Phantom HD2 remotely operated vehicle (ROV) was used during the first exploration of the "mystery tug" later identified as the USS Conestoga. 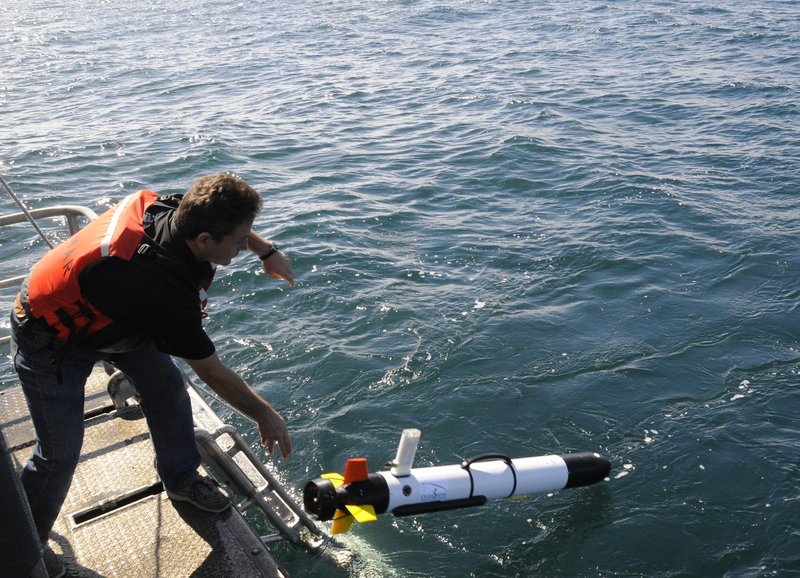 Teledyne SeaBotix's operator Cyril Poissonnet launches an autonomous underwater vehicle (AUV) off the stern of the research vessel Fulmar during the October 2015 expedition to the USS Conestoga shipwreck. 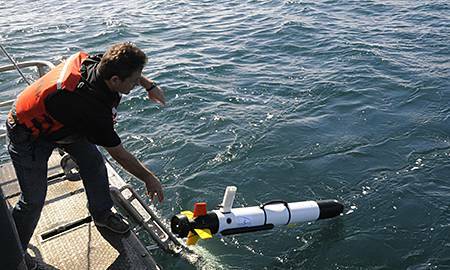 Teledyne SeaBotix also provided a small remotely operated vehicle (ROV) to record some of the interior spaces of the shipwreck. 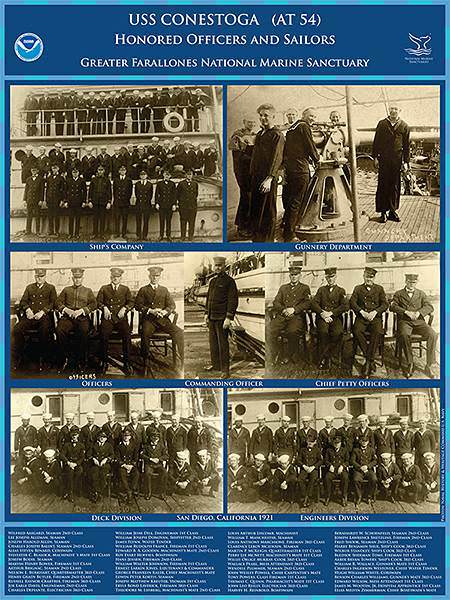 Photo collage of the crew on board the USS Conestoga (AT 54) at San Diego in 1921. 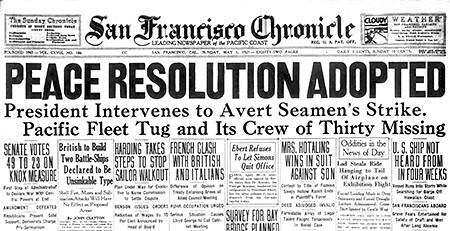 When the tugboat steamed from Mare Island, California to Pearl Harbor, Hawaii on March 25, 1921 the full complement was 56 crewmen. 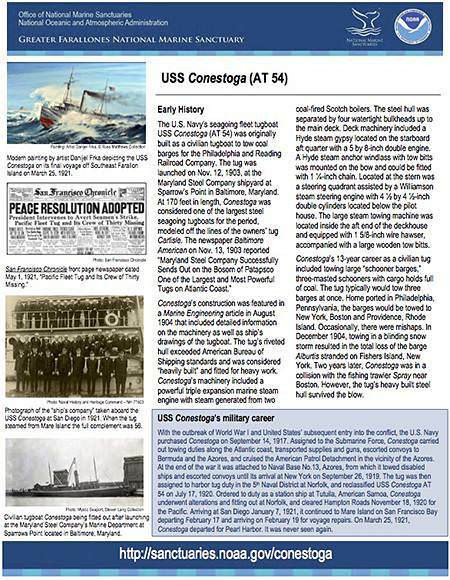 Archaeological report on the discovery of USS Conestoga (AT 54). 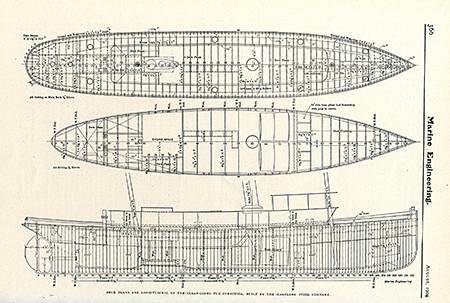 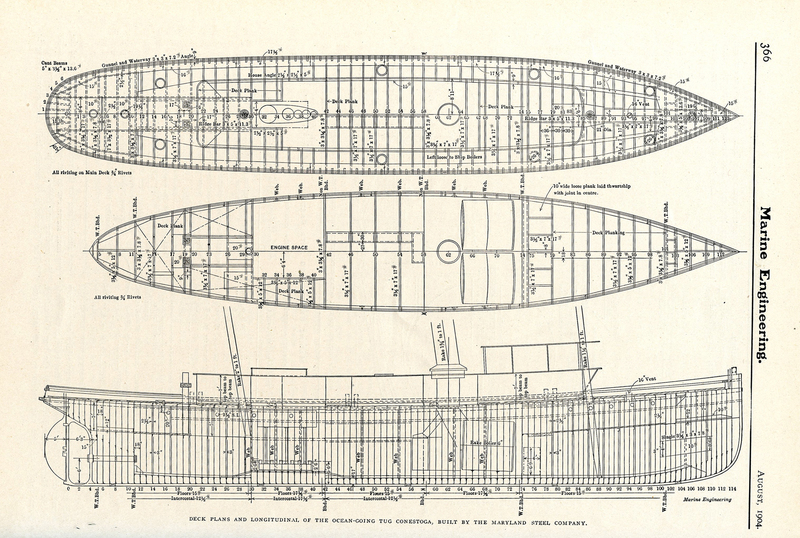 Deck and Longitudinal View of Conestoga, as reproduced in Marine Engineering 1904 Vol. 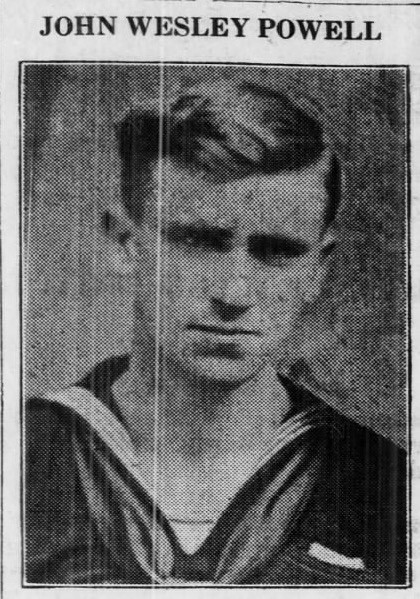 9, page 36. 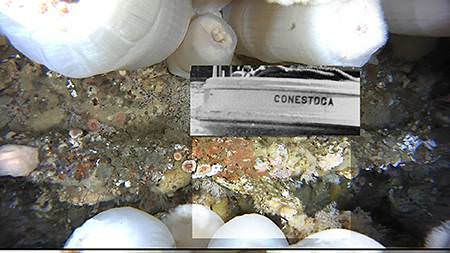 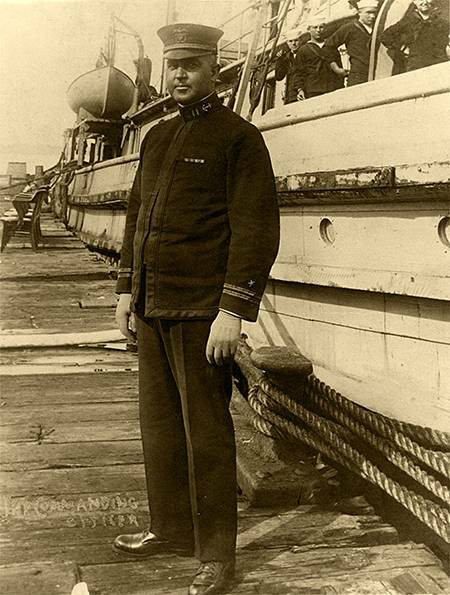 James Delgado, Director of Maritime Heritage for NOAA's Office of National Marine Sanctuaries, explains the importance of the discovery of the USS Conestoga.